Find and compare the best prices from a range of well known car rental companies at Antalya Airport. This is a free to use facility, enabeling you to book direct with the company quoting the price. 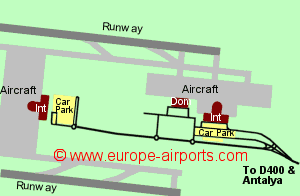 Antalya Airport, otherwise known as Airport, is located 10Km East of Antalya, on the south west coast of Turkey. The historic city of Antalya sits on a picturesque position on a cliff, with mountains behind. Antalya airport has two modern international terminals, 1 and 2, located approximately 1.5km apart, plus a separate domestic terminal located between the two International Terminals. The terminals have been undergoing refurbishment in recent years. There is a frequent (every 30 minutes) bus service between the airport and the city. Antalya airport has 43 bars/restaurants, bank, currency exchange, cash machines, 15 shops,a post office, luggage lockers (T1 and domestic terminal), and free WiFi Internet access in certain areas of the terminal. Antalya airport has Airport Carbon Accreditation, at the Neutrality level. Passenger numbers totalled 25.9 million in 2017, an increase of 38% from the previous year.